Experience the essence of \African Oceans". Awaken to the sound and sight of the sea from stylishly appointed rooms. 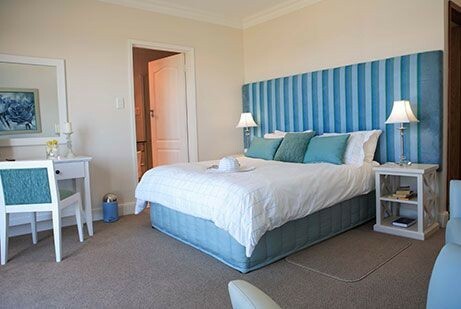 We offer spaciousness, relaxation, luxury with refined comfort and thoughtful touches with mini bar, DSTV bouquet, CD/DVD player, air conditioners and private balconies or patio's. Option of self catering. Direct access to the beach. Inspired by the rhythmic waves rolling onto the golden sand and the majestic Outeniqua mountains, African Oceans echoes perfection. 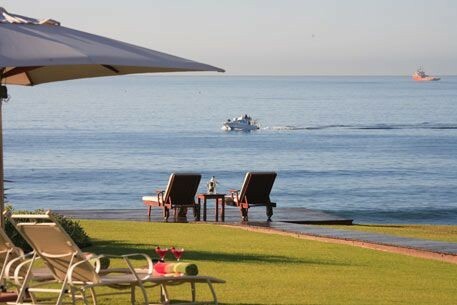 Situated in the heart of the Garden Route, virtually on the shoreline, this is the destination to create lasting memories. The exceptional treatment, the unique and thoughtful touches, the luxury and comfort all add to the enticement of returning again and again. With superb staff and individual attention one should not pass through Mossel Bay without stopping by for a visit. Our rooms offer relaxation equipped with television, air conditioning, mini bar, coffee and tea facilities as well as private balconies/patio's. We invite you to enjoy a cocktail on our pool deck overlooking the bay and the breathtaking Indian Ocean. Nearby activities, among others include elephant rides or a picnic with tame elephants, shark diving, game drives and top golf courses. 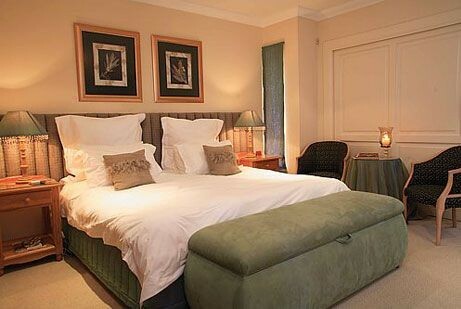 TGCSA 5 Star Guesthouse. American Express Award winner 2007 and 2008. 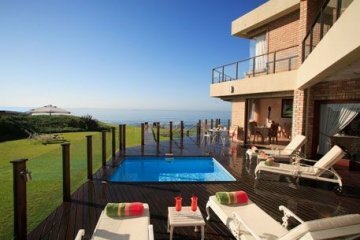 New edition to African Oceans Manor is our spectacular African Oceans Villa on the beach with oceans views from the private balconies. This exclusive beach front villa offers 4 bedrooms, 3 bathrooms, launches, fully equip kitchen, study, bar, pool table , swimming pool and 3 garages. Suite 1 is our luxury duplex unit for 2, with aself-catering, self-service option. Enjoy the privacy of your own garden entrance on the beachfront. Each room is individually decorated with style and refined comforts.The suite consists of a fully equipped kitchen with stove/oven, fridge/freezer, mini bar and dishwasher. The spacious TV lounge offers DSTV bouquet, radio, CD, DVD player, sleeper couch and leads onto a covered patio with built-in BBQ and patio furniture. Our luxurious bedroom with its romantic atmosphere creates a sense of tranquillity and peace and consists of an air conditioner, queen size bed and full bathroom with all retreat items included. The private balcony overlooks the endless beach and majestic Outeniqua mountains. 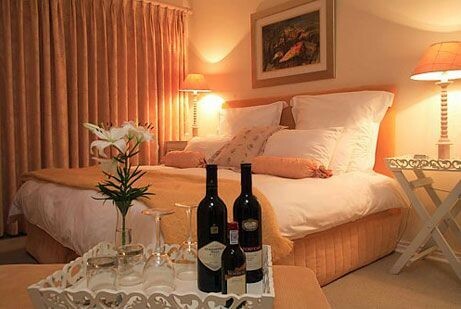 Suite 2 is a stylishly decorated standard double room with its own private entrance from the parking area. The room consists of an air conditioner, king size bed, en-suite bathroom with shower,TV cabinet with TV, coffee facilities and bar fridge. Has no seaview. Suite 3 - Natural beauty. This spacious unit with the natural colours, soft green and gold, and exclusive decor creates a sense of absolute calm and romance. Wide windows with a view over the ocean and the garden yes, a thing of beauty is certainly a joy forever... Enjoy the evening beauty with a cocktail right on the dune close to the beach. 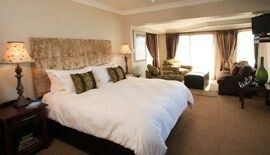 Consists of a king size bed, lounge area with sleeper couch, flatscreen TV and DVD player. A kitchenette equipped with bar fridge, microwave oven, stove plates and coffee/tea facilities. The small dining area is ideal for private meals by candlelight leading onto garden, pool and beach. Full, modern en-suite bathroom with separate toilet. Luxurious amenities and decorations with own patio. Air conditioned. This unit is a chorus to immaculate taste. Suite 4 - An absolutely lovely cream, gold and olive green room. A magnificent view over the ocean from the wide window and private balcony. Luxury! Elegance! A Victorian bathroom with a view, heated towel rails and all the luxury amenities one could ever hope to indulge in. A room to create memories. Consists of an air conditioner, king size bed, TV, radio, CD/DVD player and a kitchenette with fridge, microwave oven and tea and coffee facilities. Enjoy a glass of wine from the bar fridge, good company and the moon pouring its beam over the ocean magnificence at its best! Main/Honeymoon Suite 5 - This spacious suite with its magnificent view is stylishly decorated with shades of red, silver and soft bronzes. Consists of an air conditioner, king size bed, lounge area with sleeper couch for 2 children, flatscreen TV, CD/radio player and DVD player. 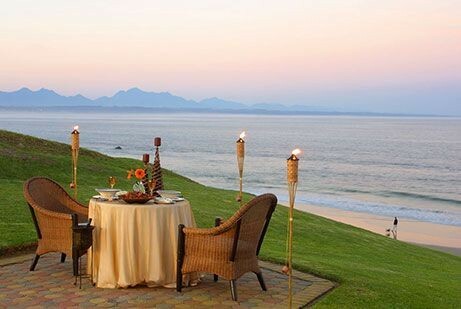 Enjoy a sunset drink on the private patio with the sweeping views over the golden beach and majestic Outeniqua mountains. Spoil yourself in the spa bath in the spacious and modern full bathroom, complete with all the luxury amenities to indulge in. Small kitchenette with microwave oven, bar fridge and coffee/tea facilities and lounge area. 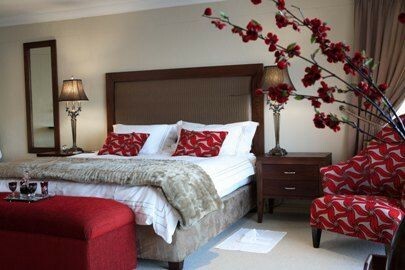 Suite 6 - This suite has a private entrance and is stylishly decorated with shades of beige, brown and autumn softness. Consists of an air conditioner, king size bed, TV and DVD player. A kitchenette equipped with bar fridge, microwave oven, toaster, stove plates and coffee/tea facilities. Private build in BBQ on the deck overlooking the ocean partly. No sea view from bedroom. Full, modern en-suite bathroom with luxurious amenities and decorations. This unit is a chorus to immaculate taste. Family Apartment - Suite 1 & 2 combined is our luxury duplex apartment for 6, with either a B&B or self-catering, self-service option. Enjoy the privacy of your own garden leading to the pool and beach area.